Many different kinds of animals lived in the world during the time of the dinosaurs. 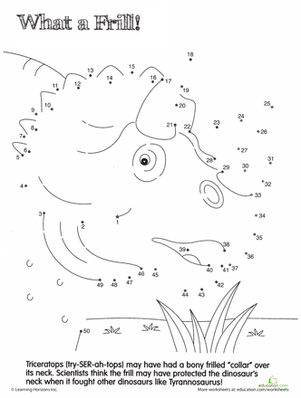 Learn about Ichthyosaurus, a reptile that lived in the ocean, with this cool dinosaur dot to dot activity. Learn about this dino with a fun dot to dot. Learn more about Gallimimus, one of the fastest dinosaurs, with this cool dino dot to dot. Brighten your dino lover's day with this fun fact dot to dot all about Struthiomimus, the "ostrich mimic". If your child is into dinosaurs, this dot to dot featuring the dino Dimetrodon is sure to make his day. If your kid's a dino buff, chances are he knows Triceratops. With a neat fact about this classic dino, this dot to dot is not only fun, it's educational, too. Megalosaurus was a giant carnivore similar to Tyrannosaurus Rex. 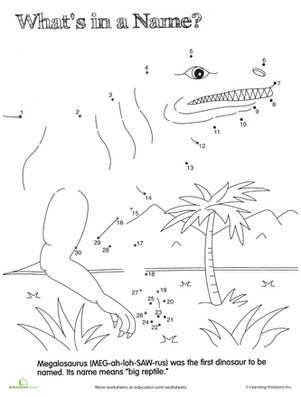 Learn about this classic dino with a dot to dot coloring page. For dino lovers, this dot to dot featuring the winged Rhamphorhynchus is sure to be a hit. Huge Carcharodontosaurus has a name to match his massive size! Delight your little dino lover with this fun dinosaur dot to dot. For dinosaur lovers, this dot to dot featuring armor-plated Hylaeosaurus is sure to please. Spark your child's interest in dinosaurs with this prehistoric dot to dot featuring plant-eating Stegosaurus. Learn about Supersaurus, one of the largest dinosaurs ever recorded, with this fun fact dot to dot printable.